This is the second edition of what we hope will be a weekly broadcast of what’s happening in the world of Pokemon Go raids. 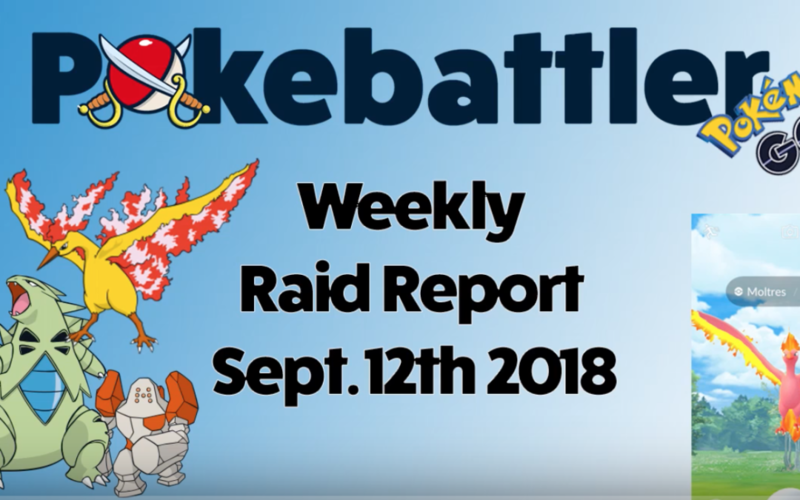 Thanks to our site Pokebattler.com, we’re able to offer unique analysis on the ever-changing popularity of raids every week. So we’re still stuck in Regi Purgatory with the totally mediocre Regirock being the main legendary available in raids right now. But Pokemon Go likes to throw us some bones every now and then with the limited time legendary bird raids, finishing the trio with Moltres available for 3 hours last Saturday and of course, in shiny form. Personally, I think his shiny form made him look like some sunburned plucked chicken and was not the best color choice, but I’m still excited I got one so I shouldn’t be too judgy. Pokemon GO will be releasing all three of these birds again, all at the same time, between September 13 and 20th. Why, after all the hoopla of the three-hour availability are they doing that? I have no idea. Will they have the limited time moves like sky attack? I still have no idea. But these legendary birds are way more useful than Regirock, so it does make raiding more exciting. And exciting news, Mewtwo will be available as a normal Tier 5 raid, no ex-raid pass needed, September 20th until Oct 23rd! But it’s still not as exciting as some NEW super strong legendaries. So we at pokebattler.com are so excited for Gen 4 legendaries, we updated the site to see just how awesome they are, assuming Pokemon Go doesn’t change their stats. So check that out at Pokebattler.com/raids. So without further ado, let’s get to the most popular raid countdown. Starting at number 10 is Kirlia, down from number 9 last week with 2.57% of overall raid searches. This mon is the second evolution before it’s final current form, Gardevoir. Gardevoir is a decent mon that sometimes comes up as a top 6 counter and comes up consistently in the top 25 as a defender. But… we’re pretty sure the popularity comes from the fact that this is a rare mon and not easy to find out in the wild. The estimate for level 35 is .29 which means you can chop off three limbs and STILL take Kirlia solo. OK, please don’t actually chop off any limbs. But you can definitely solo Kirlia as long as you’re a decent level. Top counters are: Ghost mons like Gengar, Mewtwo and Banette, Steel mon Metagross and poison mons Victreebel and Alolan Muk. Number 9 is Absol down from number 7 with 3.54% of overall raid searches! Absol is pretty useless, but he’s only available in raids and he is tier four which means you can’t take him solo. His estimator is 1.69 so you definitely need a friend to take him. Fighting mons like Machamp, Breloom, Hariyama, Blaziken and Herocross will take this mon down. Number 8 is Donphan, who didn’t make the top 10 last week, with 3.62% of overall raid searches. Donphan is a tier 3 Pokemon and barely makes top 25 in our defense rankings making him slightly less than useless for leaving in gyms. We believe his popularity is due to the fact that he is hard to solo but it is possible with the right counters. And those would be Double Water Kyogre and Double Water Gyarados. And for those who don’t have the mons to solo, find a buddy and you can also use Double Grass Venusaur, Exeggutor, and Sceptile and double Ice Jynx. Have you managed to solo Donphan? Share with us in the comments. Number 7 is Ho Oh! He was number 3 last week, which made sense as he had been available for a few days, but now he’s got 4.32% of the overall raid searches… and we have no idea why. Maybe people were researching their recently caught ones? He wasn’t available last week anywhere so… head scratcher. Holding steady at number 6, same as last week, with 4.86% of overall raid search is Alolan Marowak. He’s completely useless like his normal form, BUT he’s super cool looking in Alolan form. I mean look, his stick is on fire! Anyways, Marowak won’t go down easy and takes 2.43 trainers at level 35. Top counters are Ghostly Ghastly, Double Water Kyogre, Physic/Ghost Mewtwo, Dark, Rock Tyranitar, and double water Gyarados. Number 5 is Mewtwo down from 4 last week with 6.2% of overall raid searches. Remember, he’ll be available without an ex raid pass starting September 20th. Finding the best counters for Mewtwo can be complex, we recommend you check out our infographic article on him with a link in the comments. With an estimate of 2.69 at level 35 you’ll need at least 3 trainers. And if I were going after a Mewtwo with unknown moves, I’d want an army of double dark Tyranitar, some psychic ghost Mewtwo, and maybe a double dark Houndoom or two. I will be about 11 months pregnant by then, and I can just imagine my husband, Pokebattler founder Celandro, dragging me across Santa Monica to do Mewtwo Raids. He says he’s planning on getting a wheel barrow for me. Sigh. Number 4 is Tyranitar who jumped up from number 10 last week with 6.34% of the overall raid searches. Maybe people were grabbing a few more ttar to use against Moltres last Saturday? He’s super useful and constantly comes up as a top counter for those birds next week. Although his rock quick move is no longer available (and totally awesome btw) his other moves are still super strong and of course you wanna get dat candy. He’s a tier four with an estimator of 2.19 at level 35 so you’ll need 3 trainers to take him down unless you are maxed out or have partly cloudy weather on your side. If you want to take down Tyranitar, you want to bust out your fighting mons, like Machamp, Breloom, Hariyama, Blaziken and Heracross. Number 3 is Machamp, down from number 2 last week, with 8.38% of the overall raid searches! He’s still the strongest fighting mon in the game and a very strong counter against a lot of different mons and is a top 10 attacker in our rankings. He’s tier 3 and with an estimator .76 at level 35, you can totally solo him if you’ve got the right mons. Those mons are double psychic Mewtwo and Alakazham, a fire and flying Moltres with Sky attack, a move that was only available last Saturday, Sept 8th, Double Psychic Espeon, Double Flying Rayqauza, and Physic Fairy Gardevior. Dropping from the number one spot to number two with 9.34% of overall raid searches is Regirock! Not surprising as he’s the main legendary out right now. And despite being not super useful, he is still popular. To take down Regirock, you need around 5 trainers at level 35, with an estimator of 4.22 so hopefully you can find join some raider groups. His top counters are double fighting Machamp, Double Water Kyogre, Mud shot Solar Beam Groudon, Double Fighting Breloom and Hariyama. And Number 1 is…. Moltres with a whopping 20.89% of the overall raid searches! Wowzers! Moltres came out last Saturday so we hope you caught some. But if you didn’t, don’t fret, he’s coming out again with his birdy friends starting September 13th for one week. We think Moltres is THE strongest and therefore super useful fire mon. Check out our recent infographic for the best counters at articles.pokebattler.com and you’ll see they’re mostly Rock Mons including the super strong double rock Tyranitar that is a legacy from community day, both Alolan and regular Golem, double water Kyogre, then back to rock dudes including Regirock, Luna or Sol Stone, and Rayquaza with Ancient Power. So that’s it for our weekly raid report. Check in next week to see what pops up on our raid charts. Subscribe to make sure you don’t miss our next video. Later!